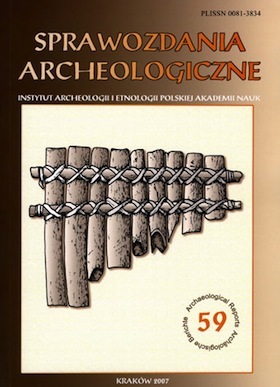 The article is a juxtaposition of the published data which covers 66 seasonal camps and small settlement remains of the Corded Ware population from the area of south Germany, Poland, Ukraine, Czech Republic and Slovakia. Data which comes from the analysis of the artifacts, mainly ceramic materials, discovered at settlements were compared with the conclusions made according to furniture of graves. On this basis chronological division was made: settlement sites were divided into three phases. Further conclusion was the model of Corded Ware settlement development, essential part of which constitute economy issues. The author points out specific relation between settlement sites and cemeteries CWC; also the important role of the pottery ornamented with cord along with Short - Wave Moulding in the aspects of CWC settlements sites.